I’m still super in love with my Amazon Echo, so I pre-ordered an Amazon Tap when it was announced and eagerly awaited its March 31st arrival. 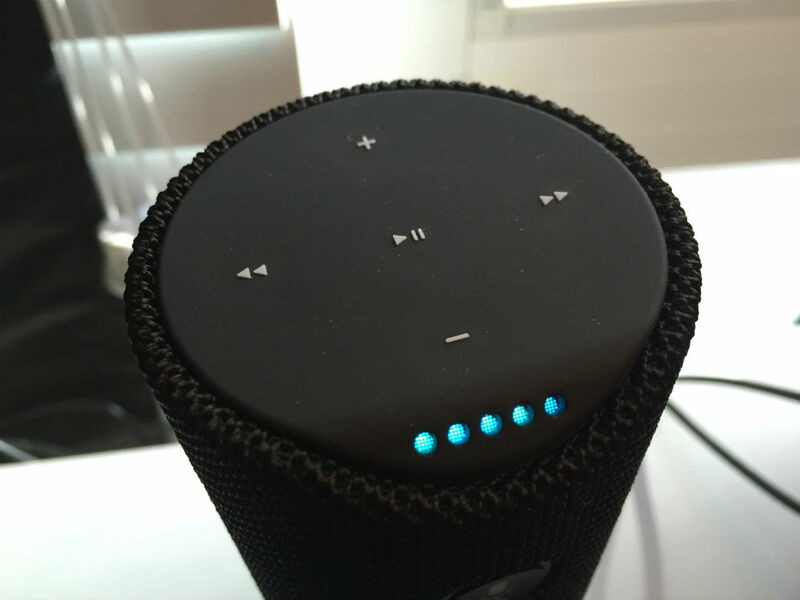 I was hoping for a slimmer, lighter, less-expensive alternative to my Bose Mini SoundLink and while the Tap lags behind my Bose in terms of audio quality, I found many other reasons to love the Tap over the past several days. Read on for my hands-on Amazon Tap review! Tap is basically a smaller, portable Echo with some notable tradeoffs. Its primary function is to be a portable Bluetooth speaker, but it’s greatest weakness is its bass quality. It’s not bad audio, per se, and oddly enough – it seems to have gotten better after using it for several days – but it’s definitely not the room-filling bass you’d get with a Bose Color Mini or a Bose Mini SoundLink (two similarly priced Bluetooth speakers that I already own and use around my home). The big Tap advantage, of course, are that you get access to all that Alexa has to offer in this speaker (provided you have it on a WiFi network – no Alexa at the beach). It used to be that you had to hit the microphone button to wake up Alexa, but Amazon updated the software to allow Alexa to be “always listening” on a Tap. You can ask Alexa to announce the weather, ask her to play one of your Amazon Music playlists, ask her adjust your home’s temperature (if you have a smart thermostat that is Alexa compatible such as the Ecobee3), or turn your lights off (like I do every day with my Alexa-integrated Phillips Hue). There’s more: the Tap holds about 9 hours of battery life, which is competitive with other Bluetooth speakers in its price range. It’s also one of the more portable Bluetooth speakers I’ve ever owned, weighing about 1 pound and with no hard edges and no particular “facing direction”. How is Amazon Tap different from the Amazon Echo? 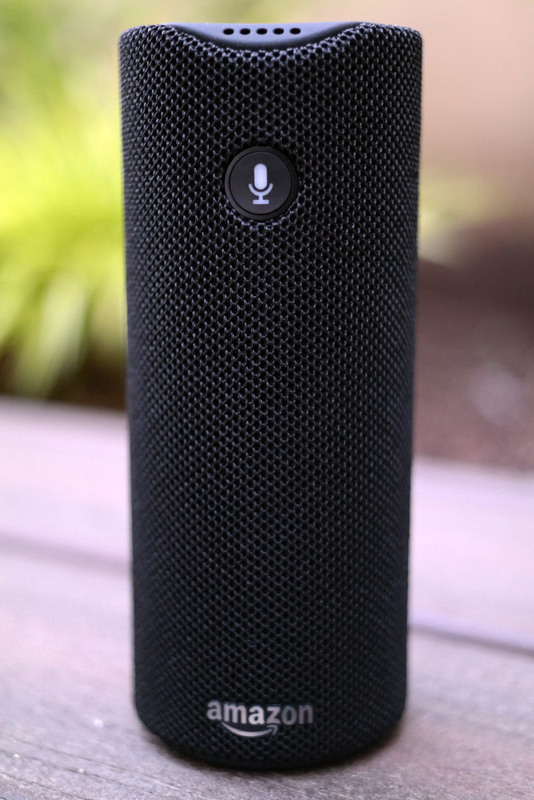 Tap can be tap activated or voice activated – you can decide whether the Alexa in your Tap is “always listening” or only listens when you press the microphone button. The other on-unit buttons let you skip songs, change volume, turn it on/off. This is true even when the Tap is docked. What do Amazon Tap and Amazon Echo have in common? Both Tap and Echo have access to Alexa, Amazon’s voice-controlled “smart hub” system. You can issue all the same Alexa commands to Tap as you can to Echo (just press the mic button first). 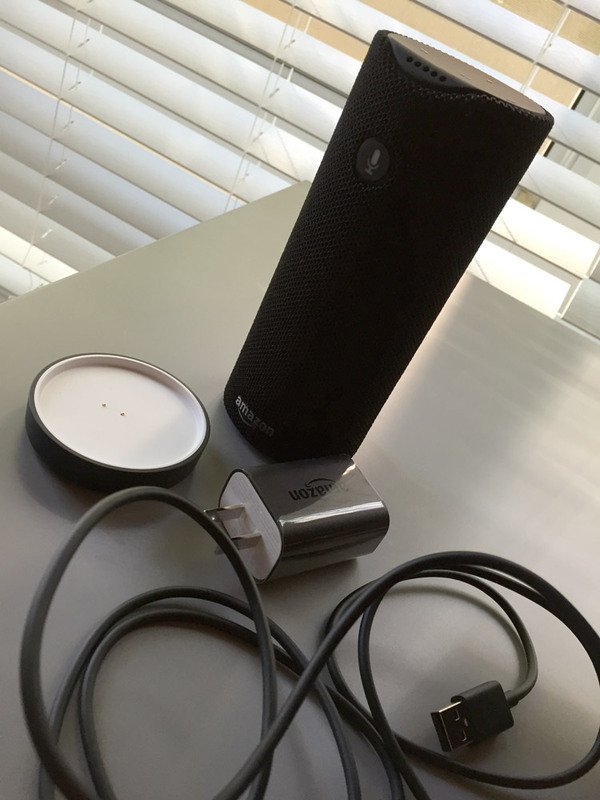 Amazon Echo and Amazon Tap side by side – notice the Tap is smaller and has more on-unit controls. What is Amazon’s Echo Dot for? It’s a voice activated “control center” that you hook up (via Bluetooth or the included aux cable) to another speaker set, such as a Tap, a Bose system, a Sonos system, or your choice. (I don’t own an Echo Dot). 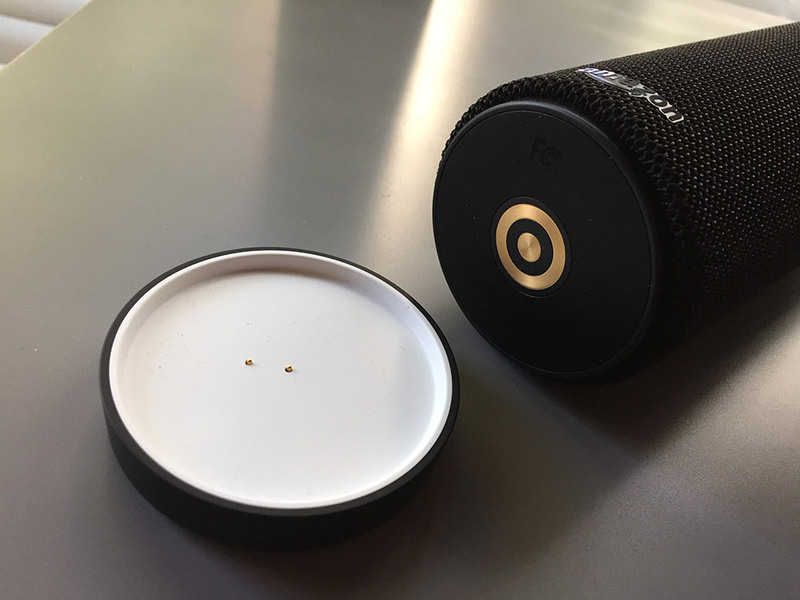 Echo Dot has its own little speaker inside, but the idea is to take the brains of the Echo and transplant them onto whatever (presumably awesome) speaker system you happen to already own. Think of Echo Dot as Amazon’s way of saying, “You don’t like our speakers? Fine, you can hook this Echo Dot up to your own speakers – and still enjoy our voice-activated Alexa stuff”. It’s the best of both worlds. As of this writing, the Echo Dot can only be ordered by people who already own an Echo, but you can still check out its features and specs via that link. How does the Tap audio quality compare to other Bluetooth speakers? The Tap’s audio quality is about what you’d get from a $120-ish Bluetooth speaker. It lags behind similarly priced speakers from Bose. It’s strength is in the Alexa integration – if you only care about audio quality, get a Dot and hook it up to a better speaker. Weirdly enough, I thought the Tap sounded borderline terrible right out of the box, but after a weekend of heavy use, I swear it sounds much better. My partner insists this is because it’s gone through the speaker break-in period, which I’d never heard of before but it makes sense and the Internet agrees it’s a thing and the Tap really does sound better after many hours of use. I also don’t think I just got Stockholmed into accepting it – when I compare side-by-side with my Bose Mini SoundLink after a weekend of use, the difference between them is still noticeable (the Bose sends waves of bass through my desk) but the Tap isn’t THAT far behind – not as much as it was when I first unboxed it. If audio quality is everything to you, though, then look at the speakers Bose makes. I can personally recommend the Bose SoundLink Color (slightly less expensive than the Tap) and the Bose Mini SoundLink (slightly pricier than the Tap). The Bose SoundLink Color in particular has a much fuller audio range than the Tap, comparable battery life, and identical on-unit controls. (However, it’s worth mentioning that the SoundLink Color is 50% (half a pound) heavier and slightly larger than the Tap). The Tap really stands out at connecting over Bluetooth quickly and painlessly. The best thing? You can wake up the Tap speaker over Bluetooth without first having to press a button on the Tap to turn it on. This means you don’t have to get out of bed to fire up the Tap, just connect to it from your phone. (As if my Echo wasn’t already contributing to a massive amount of laziness around here.) This works whether the Tap is on its base or not. This ease of connectivity merits mention because of the many struggles I’ve had in the past with getting my family’s various iPhones and my partner’s LG to sync with various Bluetooth devices, including my Subaru Forester, his (incredible sounding) Bose SoundLink III and my own (beloved) Bose Mini SoundLink. Bluetooth can be janky and annoying to get connected, so when the Tap just quickly accepted my phone (and my partner’s phone) it was like wow. 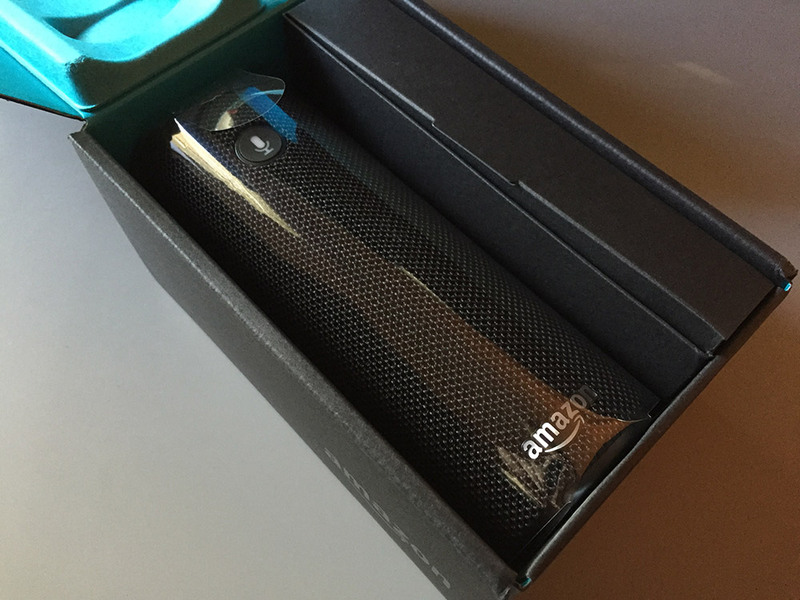 Just like its Echo ancestor the Amazon Tap arrives in a beautifully packed box. The narrow box to the right of the speaker unit contains the charge cable, wall adapter, charge base, and a small instruction booklet. Something I noticed right away with the Tap is how perfectly it docks with its cradle. With similar Bluetooth speakers, I’ve encountered occasional ambiguity over whether the speaker was actually docked or not. Not so with Tap – it’s pretty much impossible to set it on the base in a way that makes it look properly docked without it actually being docked. pairing button that is used to enter Bluetooth pairing mode or to help it get on your WiFi network. The narrow port above the pairing button is the Micro USB port. You can charge the Tap via its cradle or plug it into the charge cable directly. Not having the bring the cradle with for charging makes the Tap even more portable. Think of Tap like a second generation Echo instead of an addition to an existing family. Echo and Tap do not communicate with each other. I know, I was bummed about this too, and there’s a chance that it might change with a firmware update in the future. I mean, why not? Why not have the option to have the Tap listen for Alexa commands as long as it’s plugged in or on its base? I could see some potential for conflict if they both use the same wake word, but this problem doesn’t seem insurmountable. My Tap is surprisingly well-traveled for having only been in my possession for a few days. Already, it has watched over several games of pool down in my apartment’s rec room and ridden along for many miles on a muddy bike trail. 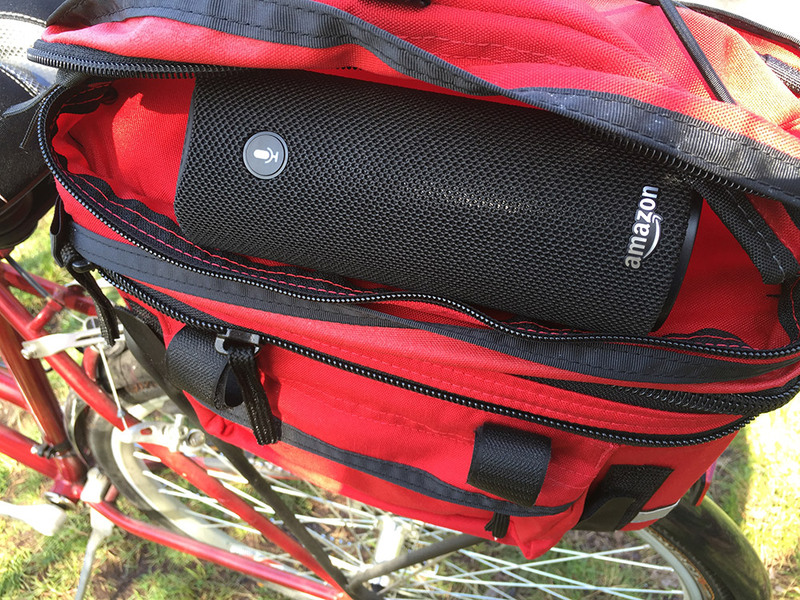 Below, I stuffed the Tap speaker into my bike bag, turned up the volume, and became the only party bike on the trail Saturday morning. If you’re heading out with a group of people this summer, be it for a picnic, a trip to the beach, a party at someone’s backyard pool, a ride on the bike trail – you might get a kick out of having the Tap along to play some music for your group. My partner and I definitely did. What could Tap do better? Better bass – I am all about that bass, and even after the break-in period, the Tap isn’t quite where similarly priced offerings from Bose are on bass levels. It’s a solid speaker with a lot of nice extras thanks to Alexa integration. If you already have an Echo and want to keep doing things you do with the Echo, you can keep doing them with a Tap. Mostly, it’s about tradeoffs: with a comparably priced Bose, you’ll get richer bass but you won’t get access to Alexa features and I think the Bose physical designs are somewhat less portable than the Tap.